The first phase of the proposed metro could take just five years to be completed. The proposal for an underground train system for the island has captured the public imagination. Ivan Martin speaks with the architect behind the idea of a Malta Metro. Imagine entering a metro station beneath Valletta’s Triton Square and coming out at the airport in 15 minutes or the bus station in central Victoria Gozo in just half an hour. An opinion piece in last week’s The Sunday Times of Malta mapping out such a Malta Metro system went viral. Konrad Xuereb, a director at KonceptX, an architectural and structural engineering firm with offices in Malta and London, believes that his proposal is not only feasible, but could solve many of the island’s traffic related problems. He is proposing a national metro system to be carried out in three phases. Based on the use of two tunnel boring machines, the first phase of the proposed metro could take just five years to be completed. The second and third phases would be anticipated to take a further two and three years respectively. 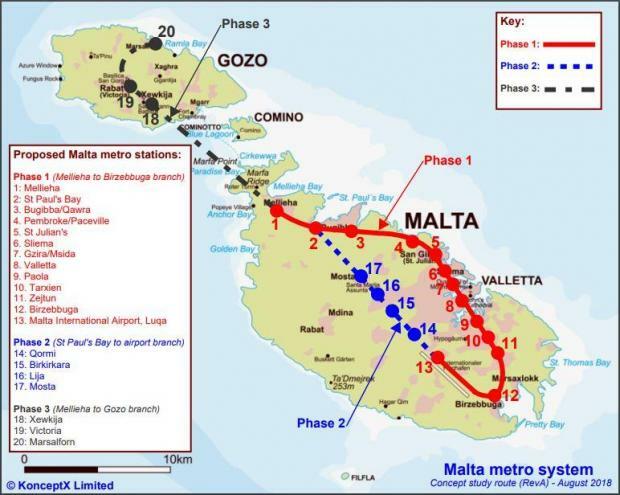 The first phase could be approximately 25km long, connecting Mellieħa to Birżebbuġa, with a loop at the end to the airport. This metro line, he says, could stop in dense urban centres including St Paul’s Bay, Pembroke and Paceville, St Julian’s, Sliema, and Msida with stops at the University of Malta and Mater Dei Hospital). Valletta, Paola and Żejtun could also have stops. The second phase would be approximately 10km long, connecting the airport to St Paul’s Bay in the north, allowing the metro to form a loop. This second part of the metro could link other dense urban centres including Qormi, Birkirkara, possibly Mrieħel and Mosta. The third and final stage would be approximately 15km long, extending between Mellieħa and Gozo, connecting Xewkija, Rabat and Marsalforn on the sister isle Gozo. It would take merely half an hour, Dr Xuereb said, for someone to board the metro at Victoria in Gozo and arrive at the University, Valletta or the airport. Is this a realistic timeline? Dr Xuereb said that, to put things into perspective, construction work on the 118km long Crossrail underground metro in London (more than double the length of that proposed for Malta) started in mid-2009 and is planned to open later this year. What to do with the rubble? And what about the debris that digging a Malta metro would generate? Dr Xuereb anticipates that the excavation for the whole metro system, including the 20 metro stations proposed for across Malta and Gozo, could generate between three to four million cubic metres of earth in waste. In the Crossrail underground line in London over three million tons of earth from tunnel excavation were used to create a new nature conservation area at Wallasea Island on the River Thames Estuary, transforming it into a thriving wetland teeming with bird and marine life. Subject to detailed environmental studies, most of the inert waste from the construction of the proposed Malta metro could be strategically used for land reclamation to form an offshore nature reserve or an offshore wind farm, Dr Xuereb said. An offshore windfarm could also be complemented by an offshore solar farm, with the solar panels connected to the national grid. The London Array offshore wind farm, for example, is a 175 turbine 630 MW windfarm in the Thames estuary meeting the electricity needs of 750,000 homes and cutting annual carbon emissions by 900,000 tonnes, equivalent to that generated by 300,000 passenger cars. Would tunnels destroy archaeological remains? And as for the impact digging a tunnel could have on the island’s geology, Dr Xuereb said the Malta metro tunnel would predominantly be located at a depth of approximately 25 metres below ground level, dipping gently under the channel. This would ensure that the construction of the tunnel would not disturb the superficial soils and top geological strata where any yet undiscovered archaeological remains may be lying. Notwithstanding this, detailed environmental and archaeological studies would be required before the final metro route and station locations could be fixed. The location of most large cities close to waterways like rivers entails that new metro projects typically encounter complex ground conditions during construction of the tunnels. Illustrating this further, Dr Xuereb said the construction of the Crossrail underground line in London entailed boring through varying, challenging, ground conditions including London Clay and Thanet Sands, which necessitated assessment of ground movements and mitigation strategies like ground stabilisation to limit damage to the buildings lying along the metro alignment. “By comparison, the anticipated geology of Malta along most of the proposed metro route is likely to make tunnelling for an underground metro less challenging, with a smaller risk of damage to overlying buildings during tunnelling,” he said. What about the cost? Well, Dr Xuereb said that for a metro to be feasible in Malta it would need to capture the largest number of people with the shortest length possible. “I would calculate that the capital expenditure to build a national underground system would easily reach €3 billion to €4 billion, which is nearly four times the anticipated cost of a vehicular tunnel between Malta and Gozo,” he said. However, the revenue generated from a national metro system would be much higher than a vehicular tunnel given the much larger population it would attract, including the millions of tourists visiting the islands every year. Advertising on the trains and in the metro stations could also bring in revenue and the government could obtain further cash from leasing spaces within the metro stations for retail outlets. The Crossrail project in London is nearly two-and-a-half times the length of the proposed Malta metro, tunnelled through more complex ground conditions and requiring more than double the number of metro stations that would be needed in Malta. Crossrail is anticipated to cost nearly €17 billion, but annual ticket revenues are forecasted to exceed €900 million annually in 2020 to 2021 and over€1 billion annually after that. A national metro system would also drastically reduce the number of cars on the road – cutting down on pollution from vehicles, with significant cost savings in healthcare and increased quality of life. “There is a strong need for Malta to address the public transport system holistically with a permanent connection to Gozo forming part of such a system. An underground metro will turn the nation’s current transport challenges into an opportunity,” Dr Xuereb said.